The best part about History is that won’t shut up. It insists that we consider things we don’t know and, even better, reconsider things we thought we knew for sure. We were reminded of History’s relentless truculence last fall when Saskatoon’s Stan Goertzen announced that his father was Prime Minister John Diefenbaker’s illegitimate son. Diefenbaker was Canada’s prime minister from 1957 to 1963. He was married twice but had no children, at least, that is, none by those marriages. DNA testing has apparently proven that Goertzen is related to Toronto’s George Dryden, who claims to be another of Diefenbaker’s secret children. The revelations have comforted men seeking clarity about their pasts. The startling news offers us an invitation to reconsider what we thought we knew about Diefenbaker. Perhaps our accepting that invitation invites us to reconsider all that we thought we knew about Diefenbaker’s legacy and his lessons for today. With the 2015 election on the horizon, we are discussing dirty tricks, attack ads and charm versus experience. In 1957, Diefenbaker ended 22 years of Liberal rule as voters turned against a government perceived to be corrupt, controlling and arrogant. The next election, held only a few months later, saw Dief-mania. Crowds swarmed, women fainted and men reverently reached out to touch his sleeve. His speeches were emotional, evangelical feats of oratory that were short on facts but reached out to hearts and dared voters to dream. Liberal attacks were vicious. 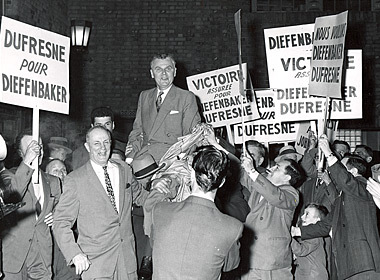 With the Second World War fresh in everyone’s mind a favorite tactic in many local campaigns was to remind voters of Diefenbaker’s Germanic name. Many of his speeches were interrupted with bigots yelling out “Hun” and worse. It didn’t matter. His campaign had become a movement and attacks were wasted where charisma ruled the day. His Progressive Conservatives took 208 of 265 seats; as a percentage of seats to be won, it remains the largest majority we’ve ever known. As our middle class collapses, we are discussing wage disparity and the power of the “One Percent”. We are seeing a revival of Reaganomics in the current Ontario election with the Tory leader convinced that firing 100,000 people and cutting corporate taxes is the best way to ensure prosperity once the benefits afforded the rich trickle down to the rest of us. The notion, of course, is that rich people won’t work because they don’t have enough money and that the poor won’t work because they have too much. John Diefenbaker was a Red Tory populist. He said that the concentration of power and wealth among a privileged few was unfair and un-Canadian. Diefenbaker criticized “elites” and argued for a more equitable balance of wealth and opportunity. His policies led to more income and security for working class families and farmers. He sought greater trade opportunities in China and elsewhere with the conviction that new markets would spur not just profits but profits and jobs; not profits instead of jobs. We are weighing immigration reform and the hiring of temporary foreign workers while the voters of Quebec made their decision on the blatantly discriminatory Charter of Values. A Montreal Canadiens hockey player who happens to be Black was recently slurred with racist taunts many of us thought belonged to the past. Diefenbaker dedicated himself to what he called ‘One Canada’. He envisioned a society where everyone is accepted for who they are rather than what they are. He appointed the first person of Ukrainian descent and the first woman to cabinet. He appointed the first Aboriginal Senator. In 1960, Diefenbaker passed a law granting Native Peoples the right to vote; it was a far cry from correcting Canada’s original sin, of course, but an important first step. He enshrined equality under the law by creating the Canadian Bill of Rights. In so doing he declared that we should consider ourselves not consumers but citizens. Diefenbaker also led the fight to rally the world against apartheid and organized the Commonwealth’s expulsion of South Africa. Sir John A. Macdonald was a transformational leader who spoke not of small ideas to win votes in the next election but of a grand vision to realize benefits for the next generation. Macdonald dreamed of moving Canada west. Diefenbaker dreamed of moving Canada north. He knew the North would not be developed and its potential not fully realized during his time in office or even during his life time but as with an oak tree the best time to plant is either twenty years ago or today. Diefenbaker advocated and then began the building what he called “roads to resources”. As climate change changes the world it is beginning with the North. It is causing damage and creating opportunities. We are now exerting our Arctic sovereignty with a renewed vigor that would make Diefenbaker smile. The Keystone XL Pipeline and Canadian Middle East policies are now testing our relationship with the United States. President Kennedy insisted that Canada join the Organization of American States but Diefenbaker said no. Kennedy demanded that Canada house American nuclear weapons but Diefenbaker said no. Kennedy said Canada should end its trade with Cuba and China but Diefenbaker said no. 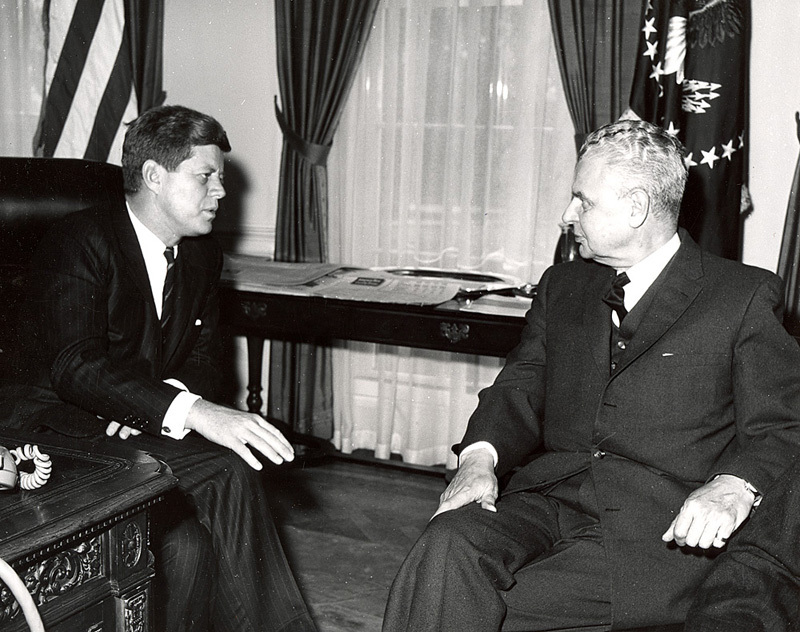 Kennedy offered assurances that Canada would be consulted on all issues related to continental defense but then, with no consultation, he assumed Canada’s immediate and unreserved support during the Cuban Missile Crisis – Diefenbaker said no. Diefenbaker was not anti-American, he was pro-Canadian. In all that he did he acted like Canada was a sovereign state to be respected. Kennedy acted like Canada was a satellite that should be obedient. Diefenbaker stood up to the bully and didn’t care if Kennedy liked him. Kennedy was not used to being told no and hated Diefenbaker for it. We are debating the role of our military in a changing world. Diefenbaker agreed with the previous Liberal government that the Avro Arrow had become too expensive and that new missile technology had rendered it obsolete. He scrapped the fighter jet project. His decision stood against military-industrial complex dictates in proclaiming that military need alone should determine military procurement. At the same time, however, he increased the defense budget along with the number of troops, ships, and planes. He established during the Berlin crisis and other moments of trouble that Canada would advance its national interests through supporting it allies and working through international organizations like the UN and NATO. History has been unkind to our 13th prime minister. Too many accounts of him and his administration were written from the perspective of butchers explaining how the sausage was made rather than those at the BBQ savoring results. Too many accounts were written by those with tender egos and partisan perspectives. But Diefenbaker’s reputation is now, and finally, being revived. At Nelson Mandela’s funeral service, Prime Minister Brian Mulroney praised Diefenbaker’s having led the way in the anti-apartheid fight. Prime Minister Stephen Harper has said that Diefenbaker was a great prime minister that deserves re-evaluation. Saskatoon’s Diefenbaker Centre has been renovated. A new Human Rights Award and Ottawa’s re-dedicated old city hall building now bear his name and as will a new Arctic ice-breaker. Yes, History has been unkind to Diefenbaker but History is never quiet for long. Perhaps the controversy regarding his secret children will invite us to reconsider Diefenbaker’s legacy. He has been gone for a long time now but like History itself he has lessons left to teach if only we are willing to learn.